KAYENTA, Ariz. — In a dimly-lit home off a tangle of dirt roads on the Navajo Nation, 80-year-old Simon Crank sits on his living room couch, recalling the days when executives from a coal company in St. Louis, Mo., would visit, bringing sweets as gifts, promising jobs. Under a shady tree, they offered steady work at union wages in a place where most families could hope for nothing more lucrative than rug weaving. The room where Crank speaks 49 years later is heated with a pellet-burning fireplace because a doctor has forbidden the elderly man to burn wood. After a lifetime working in Peabody Energy’s coal mines, his lungs can’t tolerate the smoke. Crank now drives hundreds of miles a month, seeking medical care at hospitals in Flagstaff, Ariz. and Colorado. “We were never told. We saw the income coming in, but the hazards – we never knew we were going to experience this,” he said, laying his hand on the oxygen tank that connects to his nostrils via a narrow tube. Most U.S. history textbooks acknowledge the devastation of America’s indigenous peoples, the forced relocations and exploitation that left tribes corralled on remote reservations, mired in poverty. Few point out that the exploitation continues today. On the sprawling Navajo Nation and the Hopi Reservation it surrounds, Peabody Western Coal Company routinely uproots families, locals say, in order to extract – by strip mining – 7.8 million tons of coal a year, coal that provides cheap electricity for much of the residential and business development in the Southwest. On Navajo and Hopi lands, however, thousands of poor families live without power or running water. In a region where economic opportunities are scarce, Peabody offers many people hope for a brighter future. But grassroots groups believe the costs have been too high. Like many of his relatives, almost all of whom have worked in the mines, Crank has been diagnosed with black lung. He gazes at pictures of his children – an entire wall of the Cranks’ home is hung with their portraits – and wonders if the steady pay was worth it. His 32-year-old grandson often asks the same. This is the “between a rock and a hard place” legacy left to 180,000 Navajo living on the windswept expanse of 27,400 square miles stretching across high desert in Arizona, Utah and New Mexico. The coal industry provides about half of the Navajo Nation’s annual budget, as well as 1,000 jobs that can pay $15 to $25 per hour, while leaving the land polluted and many people gasping for breath. And there are no independent studies showing the impact of the mines on the health of the people in the tribal lands. “The fact is, their environment and public health are subsidizing much of the power in the Southwest,” said Daniel Higgins, an environmental scientist doing research at Arizona State University. Higgins, who is not Navajo, has been stunned by the scope of the devastation as development in Sunbelt cities like Prescott, Phoenix and Tucson – powered by coal from lands of the Navajo and Hopi – continues to boom. “These tribal lands have subsidized the massive postwar growth in this region that continues today,” he said. The winds blowing across these high plateaus may soon bring change, however. In recent years, grassroots activists have raised questions about the fairness of Peabody’s lease agreements, protested at shareholder meetings and linked themselves to a national network of indigenous peoples intent on reshaping their economies. If successful, their efforts to curb coal mining on the Navajo Nation and to transition to cleaner energy sources could end up protecting the health of all Americans. Three years ago, Alice Tso appeared before the Navajo Nation Council to say her husband had died of black lung disease. Jimmy Manson, living with the disease, did not have any electricity to run the medical devices necessary to his health. Kee Russell reported that his children – even the baby – had respiratory problems. Simon Crank was there, too. He’d just been diagnosed and told that an oxygen tank would soon be his constant companion. The battle has David-and-Goliath proportions. Peabody is the world’s largest private-sector coal company, and its Navajo project – where coal is extracted, crushed and then carried 97 miles to the job-providing Navajo Generating Station – helped the firm reap $2.14 billion in gross profits in 2012. Gearon and the activists working alongside her number about a dozen. Still, pressure is mounting. The federal Environmental Protection Agency (EPA) has rated the generating station just west of Crank’s home as one of the top coal-fired power plants in the country in particulate emissions that result in asthma, bronchitis, heart attack and premature death. Smog from the plant affects visibility at 27 of the region’s “most pristine and precious natural areas,” including the Grand Canyon, the agency has said. 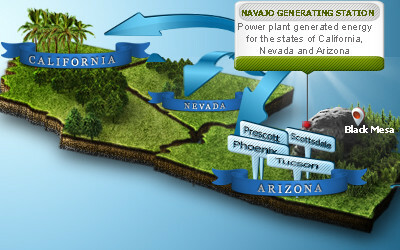 EPA spokesman Rusty Harris-Bishop said the Navajo Generating Station is one of the largest sources of nitrous oxide emissions in the country. Although signs across the company’s property proclaim, “Safety is an attitude,” in 2010, Peabody’s Kayenta mine was named one of the most dangerous in the country and has been targeted for increased scrutiny by the federal Mine Safety and Health Administration. Yet, shutting down operations is not a given. Jobs generated by the mine and power plant are coveted in a community where unemployment hovers at 45 percent and about 77,000 people live below the poverty line. “Mining on Black Mesa has generated $12 billion in direct and implied economic benefits over the past 40 years, created thousands of jobs, sent thousands of students to college and restored lands to a condition that is as much as 20 times more productive than native range,” Peabody officials told The New York Times. Unlike his relatives, Simon Crank is willing to discuss his past with Peabody and his hopes for the future. But the longer he speaks, the more agitated his wife becomes. Peabody is mandated to renew its land-use agreement with the tribe every 10 years. The next deadline is 2019. But mounting financial pressures – from the government, which wants costly new environmental safeguards at the Navajo Generating Station, and from activists demanding a greater share of the profits – appear to have spurred new action. In April, the company offered to bump its annual $3 million lease fee to $42 million in exchange for a 25-year deal and then bussed its mine workers to a meeting of the Navajo Nation Council to rally in favor. “That sounds like a lot of money, but it’s really not – we make billions for them,” said Wahleah Johns, environmental justice coordinator for the Black Mesa Water Coalition. Indeed, Peabody’s Chief Executive Gregory Boyce earned nearly four times the $3 million lease rate in 2011. Johns was speaking to a group of Navajo elders in Piñon, many of whom were learning details about Peabody for the first time. Daniel Higgins, the scientist, was at the meeting too, presenting an hour’s worth of data about Peabody’s operation, which was translated into Navajo by Marshall Johnson, 51. The following day, Johnson would travel across the vast Navajo lands to make a similar presentation to elders in Black Rock. As Higgins finished his presentation, a Piñon resident rose to speak. Ben Nuvamsa, a former Hopi tribal chairman who works to promote wind and solar energy, is making an attempt. Setting aside historical tensions between the Navajo and Hopi, he pointed out that the leases with Peabody do not provide for profit sharing with either tribe. Nor do they offer market rates for the coal extracted. The leases also allow the company full rights to any copper, uranium, silver or gold that might also sit beneath the leased lands. Claudia Rowe is a Seattle-based freelance writer. She has written for The New York Times, Mother Jones and InvestigateWest. Photographer Mike Kane is also based in Seattle. His work has appeared in Wired.com, NBCNews.com and USA Today.